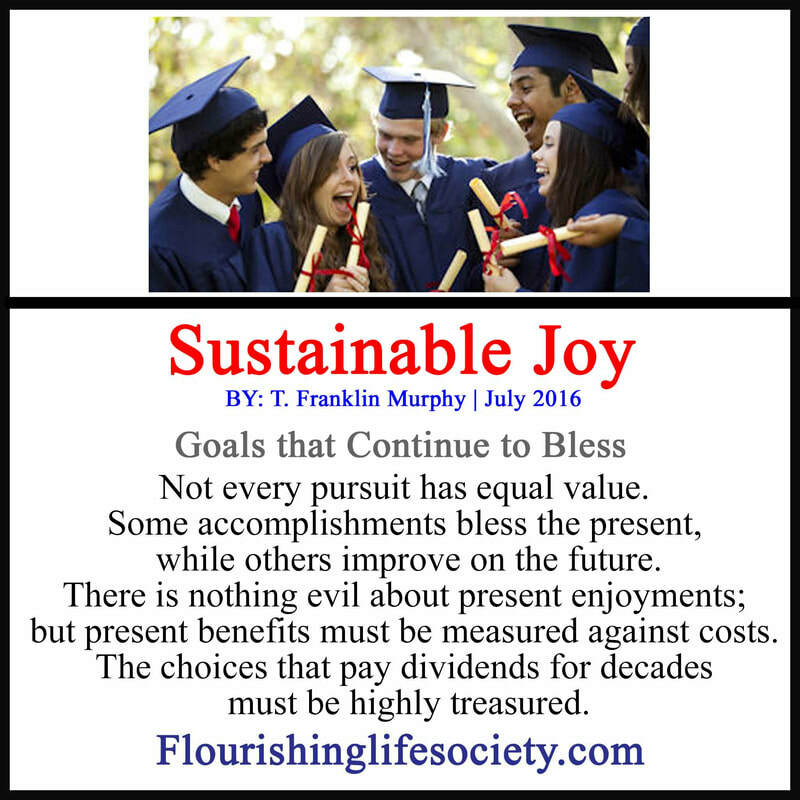 Sustainable joy is more than present pleasure. The best lives comes from actions that produce joy over time, not just momentary amusement. We want happiness; we want joy. These wants are natural. I suppose most could enjoy life a little more. The joys tend to get stuck in the hubbub of living; we ruminate on difficulties and entertain dreams that never arrive. We contemplate the pleasures of having more but neglect the necessary work required, focusing on the end but avoiding the treacherous paths directly in front of us. A happier life may demand a few adjustments, breaking free of the disappointing cycles we currently are swept up in. we need effective planning and achievable goals. Goals are necessary for achieving an intended change. Goals motivate, pushing to new heights, giving proper direction to present action. However, goal achievement is not the gold standard for happiness. Initially the achievement brings a wave of pleasure; but the achievement alone is not enough for the sustainable joy we seek. The satisfaction of achievement fades. Our momentary basking in accomplishment gives way to new goals, new feelings of lack, and the return of dissatisfaction. We return to the work of living. We can experience a more sustainable joy when we enjoy living. The movement of life through achievement and desire, and work. When we discover that true joy comes from living life—working, growing changing—we can escape the perpetual cycle of disappoint over the life we currently have. The new car, the new job, the bigger house, the younger wife or more powerful husband will not satisfy. We can’t expect much happiness if we are constantly trudging through painful paths to achieve some fabulous future reward. The intense emotional reaction to a reward quickly fades. Our biology dictates a flattening of emotion. A constant push to return to homeostasis. Enjoying the beauty of equilibrium, the peace of living, provides more satisfaction than constantly charging for some extreme emotion we can never sustain. A final achievement is the crescendo, followed by a steady waning of the positive feelings. We become accustom to the new height, no longer delighted by our gain, left to process the disrupting forces of faulty expectations from life. "Enjoying the beauty of equilibrium, the peace of living, provides more satisfaction than constantly charging for some extreme emotion we can never sustain." I spent several years training clients at a local gym—my hobby job. I listened to many incredibly high goals: I want to run a marathon; I want to lose one hundred pounds; I want six-pack abs. These are laudable goals, achievable by most. But require intense and consistent work. I noticed the essential work to achieve the goal was not calculated into the dream. Attention was focused on the final attainment and the joys the svelte new body would bring, giddy in the thought of how grand life would be. None of us are immune to the excitement of dreams. Last year, while flying to Las Vegas for a class, my mind wandered to the joys of winning a jackpot. Thoughts meandered and expanded; how I would spend the money, I could cut back on overtime, life would be great. The thoughts were quite pleasurable. After returning home, I continued to budget, maintained the extra hours, and moved forward towards my attainable dream of retirement. If a passing positive feeling is what we seek---dream away, the mission is accomplished. But if we desire to achieve that dream, we must move into reality. If we want the joys of greater health through weight loss, we must jump on the treadmill and skip a few desserts. As far as my financial security, the jackpot is fanciful, chasing riches on a gaming table is futile, and reality (statistics promise) is I will lose much more than I will win. My goal of financial security was not misguided; just the plan to pursue security at a blackjack table was. Usually in the early moments of contemplation, we fail to consider the difficulties that lie in the path ahead, consideration of obstacles might disrupt the pleasure of the plans and, perhaps, discourage attainment. These thoughts are not naturally pleasant; we often avoid them. We simply visualize the glorious dream and bask in the warmth—I will be rich; I will be thin. But our visualizations lack details, conveniently skipping essential requirements. We see the benefit without the costs. Losing a hundred pounds isn’t accomplished without sweat—lots of it. We shed the fat with thousands of hours of work, and months of forgoing favorite foods. When the difficulties are ignored, reality surprises expectations, neurons fire in unexpected displeasure. When the Asics hit the treadmill, our lungs burn and muscles ache, the goal loses its sparkle. These goals are abandoned because the path is not enjoyed. Some goals are unrealistic, we desire what we can’t obtain. Burning precious energy, working towards dead-end dreams. A necessary step towards goal achievement is some skepticism, exposing the preposterousness and recognizing potential, saving precious energy for something more practical. The world only has limited space for the Steve Jobs and Bill Gates. Goals played a role in their rise but also available resources, timing and a healthy dose of luck. The crystal ball is blurry. We can’t see change through from beginning to end. We must march forward, learning along the path. Unseen setbacks, misguided choices, and confrontations with personal limits can discourage and overwhelming. We must be prepared to face these demons of change. We only gain knowledge of all that is entailed after we begin the work. Until then, our dreams are just guessing what it takes and what it will be like. With wisdom, and a collection of failures, I have learned to enjoy the process of change. The surprises are unsettling but spark more curiosity than disappointment. Living isn’t a smooth venture. I prefer to sail with swirling winds than no wind at all. The journey becomes the joy of living. We never are blessed with perfect visions of the future—life is too unpredictable. But we move closer in our predictions with experience. When vision is askew, expecting ease, reality dampens the enjoyment of the process while on the road to change. The path is the source of a more sustainable joy. As we stumble towards change, we gain insights. We encounter problems we didn’t imagine—exciting problems of a rich life of goods and bads, successes and failures. The joys of reaching, learning, and growing.